Microsoft's Kudo Tsunoda has grand designs for Kinect beyond its current uses on the Xbox 360. The Xbox 360's Kinect is a motion camera device that will let players punch bikers, cast spells, and raise wild felines without even having a controller in the room. Kinect's creative director Kudo Tsunoda has been guiding the device along its current path, but wouldn't mind if the technology were brought outside of the videogame industry too. Tsunoda told CVG: "Kinect really is the first time that the video game industry is pioneering something that I really think has widespread application outside of just videogames." He says this is in contrast to the norm, with technologies usually coming from other industries into the videogame world. "Hypothetically," he continues, "if I worked at a company that didn't only make games, but also did things with PCs and phones, I think there could probably be some possibility that the tech might get used in other places. But, at least for now, [Microsoft is] focused on Kinect for Xbox." Tsunoda is either unaware that Microsoft does plenty of work with PCs and phones, or he's trying to be cute. Microsoft has already announced the release of its own cellphone products called the Kin One and Kin Two (though they've ended production on them) that focus on social networking, and Windows Phone 7 is its latest smartphone operating system said to be able to run software as powerful as the original Xbox's. As for PCs, well, Microsoft has some involvement with those as well too. 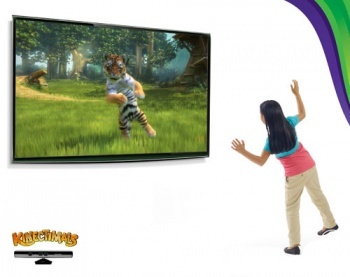 Technology similar to Kinect's may be installed in televisions by next year, but Kinect is more capable with added features such as voice recognition. Microsoft also has the ideal amount of power to promote the transfer of Kinect to new devices, i.e. lots of money. If Tsunoda's comments turn out to be hints, the way we control common devices could be changing in the near future, and that actually has me more excited than using Kinect to feed cats.